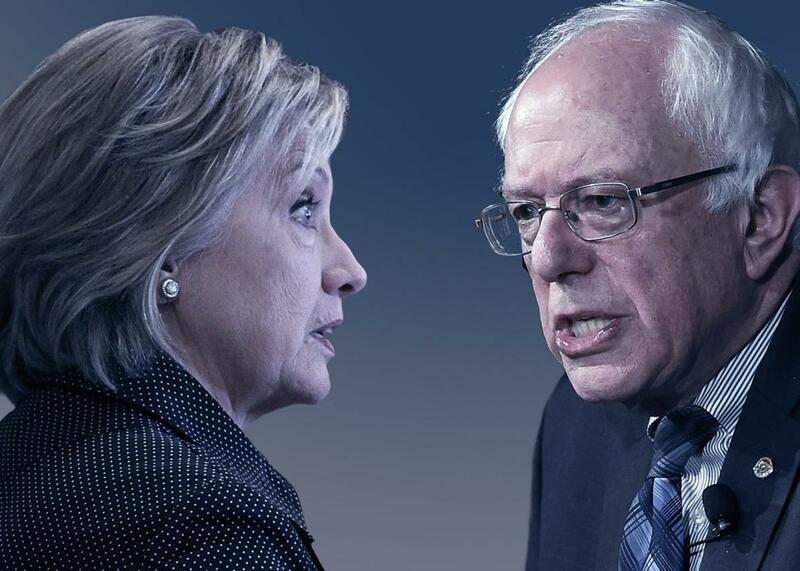 Hillary Clinton triangulates against Bernie Sanders. Her new attack on Bernie Sanders’ single-payer health care plan shows her indifference to progressive voters. Hillary Clinton is attacking Bernie Sanders’ support for a single-payer health care system. Photo illustration by Slate. Photos by Alex Wong/Getty Images and Ethan Miller/Getty Images. The Hillary Clinton presidential campaign has begun using an odd new line of attack against upstart Democratic primary rival Sen. Bernie Sanders: He’s too liberal on taxes and universal health insurance. Why is she doing this? After returning to the position in which she entered the race—as the near-certain nominee—she seems to be setting herself up for the general election. But it’s strange to see her now, after the previously shaky ship has been steadied, attacking a candidate whose supporters she’ll need in any general election campaign over an issue that his supporters care about very deeply. Triangulating against Sanders (and, by proxy, the left wing of the Democratic Party) with conservative attacks does make some sense. For one, she is a Clinton, and this is what they do. At issue is Sanders’ support for a single-payer universal health care system, which he and others brand as “Medicare for all.” A single-payer bill he introduced in 2013 would have levied a 2.2 percent tax on individuals making up to $200,000 or couples making up to $250,000, and progressively increased that rate to 5.2 percent for income beyond $600,000. It also would have tacked an extra 6.7 percent payroll tax on the employer side, at least some of which employers would likely pass on to workers. The Clinton campaign is suddenly quite upset about that proposal and wants everyone to know. She has committed to the same (policy-constricting) pledge that President Obama took in 2008 and 2012, ruling out tax increases on individuals making less than $200,000 per year or joint filers making less than $250,000. This neatly positions her camp to say, by contrast, that the bug-eyed socialist Bernie Sanders wants to take all of your money. This is a truly messed-up thing for the leading Democratic presidential candidate, who claims to be a progressive stalwart, to be broadcasting. A standard Democratic presidential nominee representing the center-left of the party might call a single-payer system politically impractical in order to argue against it. “If I were designing a system from scratch, I would probably go ahead with a single-payer system,” Sen. Barack Obama said during his 2008 presidential campaign, for example. He then explained why he wouldn’t pursue such a model: “People don’t have time to wait. They need relief now. So my attitude is let’s build up the system we got. Let’s make it more efficient. We may be over time—as we make the system more efficient and everybody’s covered—decide that there are other ways for us to provide care more effectively.” In the end that approach resulted in the Affordable Care Act, compromise legislation that greatly expanded coverage without really overhauling the country’s private health insurance model. But Obama didn’t really disown the idea of single-payer, which many progressives still prefer to the current system. Clinton, however, is going much further by appropriating one of the right’s central talking points against government-funded universal health insurance: Think of the taxes! She’s not just saying that a single-payer system is a political nonstarter with conservatives. She’s reciting the actual conservative talking point that would make a single-payer system a political nonstarter. There are fairly obvious policy counterpoints to that argument. She is well-aware of them and chooses to ignore them, because they would either blunt or negate her convenient political attack. Sure, under Sanders’ plan, the combination of the income and payroll taxes would add up to 8.9 percent (assuming employers pass on the full 6.7 percent payroll tax) on most earners. But people would not be paying for health insurance anymore, and a universal, public system would save money by eliminating all of the actuarial costs and profit expectations associated with the private insurance system. If Clinton wanted to say that she wouldn’t push for a single-payer system because it’s a political dead-ender right now, or because she’s spotted another legitimate policy flaw with the idea, that would be more acceptable. What she’s doing, instead, is essentially red-baiting about Bernie Sanders’ Wacky Taxes in her dismissal of a policy that, on paper, draws plenty of support among Democratic voters. That’s not good for the single-payer health care movement, which is hoping that some blue states will be able to use ACA waivers to experiment with single-payer in their states but so far are running into trouble thanks to the exact talking point Clinton’s deploying. And it’s not good for American liberalism in general, which is supposed to defend the belief that government funded by taxes can solve problems and improve people’s livelihoods. Perhaps the Clinton campaign has some horrific polling data that’s leading them to launch this direct assault on Sanders, or it’s just trying to distract everyone from Clinton’s bizarre explanation at Saturday’s debate for her voluminous contributions from Wall Street over the years. But it also seems like Clinton feels like she has the nomination secure and is triangulating ahead of the general election, mortgaging progressive policy in the process. Does that sound familiar?